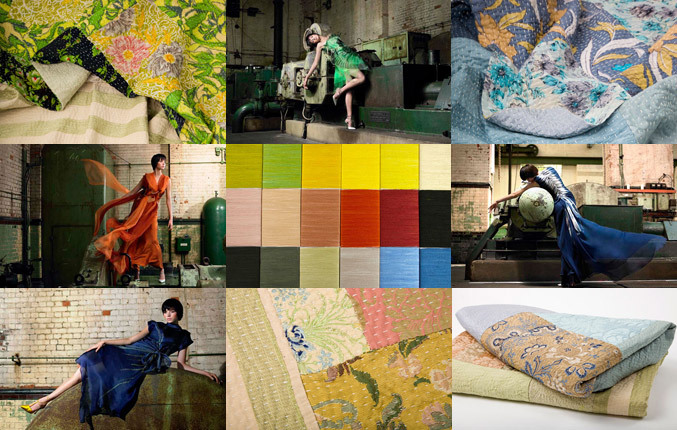 It’s not difficult to understand why mankind has a centuries-long history of using silk. A natural fabric which makes beautiful, luxurious yet durable outerwear and practical, tactile, insulating yet breathable underwear, its production also lends itself to small-scale, cottage-style industry. Unfortunately it’s usually stolen from the caterpillar of the moth bombyx mori (or ‘silkworm) in the cruelest way imaginable. The caterpillar, which feeds only on the mulberry tree and needs a warm, moist climate, spins the silk thread to create its cocoon. It can take more than 6,600 cocoons to produce one kilo of silk. 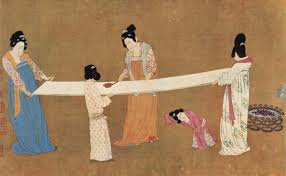 Most silk has traditionally been grown in China, and 60 million Chinese families still work in silk production. The standard commercial harvesting process involves boiling or steaming the pupating moths to kill them so they can’t break the silk threads of the cocoon when they emerge as adults. This is not only horribly cruel to the insect, it also means silk workers, who tend to be female and are often young, have to work constantly with their hands around boiling water. Even though it’s naturally durable, shiny and easy to dye, much silk is then industrially processed with metallic salts, bleaches and synthetic dyes, and may be treated with heavy metals for fire resistance or to make it “wrinkle-free” or “stain resistant”. GOTS (Global Organic Textile Standard) certified silk, if certified as ‘organic’, can be assumed to contain at least 95% organic fibres and GOTS inspectors also consider basic social criteria. But although this removes concerns about toxic pollution and worker exploitation, it can’t remove the cruelty at the heart of the industry. In the last few years, ‘Peace’ or Ahimsa silk has been embraced by many designers as an ethical alternative. The Ahimsa process removes the killing from silk production, since cocoons are harvested only after the moth has emerged alive. 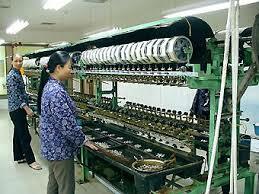 A yarn is then spun from the broken fibres. The result is a softer, warmer but less glossy and slightly weaker smooth silk fabric which can be identified by its different texture. Unfortunately the silk worm has been bred to be killed for so long now, it’s no longer adapted to survive as an adult. The spared moths are blind flightless creatures, unable to eat, and they live only long enough to lay around 500 eggs, most of which, being surplus to the silk production process, will also be allowed to die. It doesn’t seem all that much kinder. The other main domesticated silkworm is the eri moth, found naturally in the forests of Assam. It can be cultivated in a wider range of climates, since it will happily live on a range of plants including castor and privet. Some small-scale designers in the US or Europe choose to farm eri silk themselves, which is arguably more sustainable since it cuts worker exploitation and unfair international trading out of the equation. It doesn’t require the moth to be killed since the roughly triangular, open cocoon it builds tends to produce broken fibres which need to be spun in any case. Vegans have long preferred synthetic alternatives like nylon or polyester, but these are made from environmentally damaging petroleum products. If you don’t mind being seen in silk, you’re better off looking out for pre-loved garments in vintage or charity shops, or pieces made from heirloom fabrics. Check out the ‘little ao’ collection of gorgeous pieces cleverly made from old parachute fabric. More exciting are recent developments using microbes to create copies of spider silk (even stronger than moth silk). American start-up Bolt Threads, for example, has produced a nature-identical man-made spider silk using sugar and yeast fermentation, which it believes could replace not only silk and synthetics but also cotton. In Korea, academics are working to modify e.coli bacteria in a similar way. Developments like this have to potential to stop cruel mass silk production in its tracks, by more simply producing a superior product which is also cheaper.